The first thing you will notice about Paeonia Mary E. Nicholls are its huge flowers. They have a warm, ivory white hue that gets darker to the centre. It gives this peony variety a wonderfully dramatic effect that would not be out of place on a painting by Rembrandt. It also enjoys an exceptional explosive blooming. Both characteristics make Mary E. Nicholls one of the best big white peonies available on the market today. 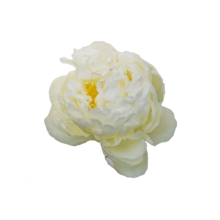 Mary E. Nicholls is a double-flowered, ivory white peony that blooms in the shape of a rose. It has exceptionally large petals and strong, thick stems. Some flowers have a small, red line that disappears during opening. The peony was bred in 1941 by Nicholls, a peony breeder who also bred the peony variety Florence Nicholls. Mary E. Nicholls is a breathtaking peony that, because of its hefty size, deserves some space. Cut its stems diagonally, put it on tepid water and start enjoying!